We are living in the times of chasing the last nanogram of impurity away from your produce. And because we care about the quality of your products, we have invested in the most efficient and precise machinery to do so. Our mass spec lab is a happy home to two triple quad and an ion trap mass spectrometer. These instruments provide a high precision ionization of the pesticides in your products by using multiple stages of screening within a single instrument. Thus, any pesticide residue analysis carried out at Maarc Labs comes with a fingerprint accuracy. Triple Quadropole LC / MS / MS system. Xevo TQD takes HPLC analysis to the next level by combining it with a mass spectrometer. So we can not only detect polar pesticides from your product with this system, but we can also tell you with certainty their presence at a parts per billion (ppb) level. Polar and highly polar pesticides are detected using this system from water, food products and vegetables and fruits. The unique Multi Reaction Monitoring (MRM) function enables us to analyse hundreds of pesticides within a single run without any ambiguity related to co-	elution. 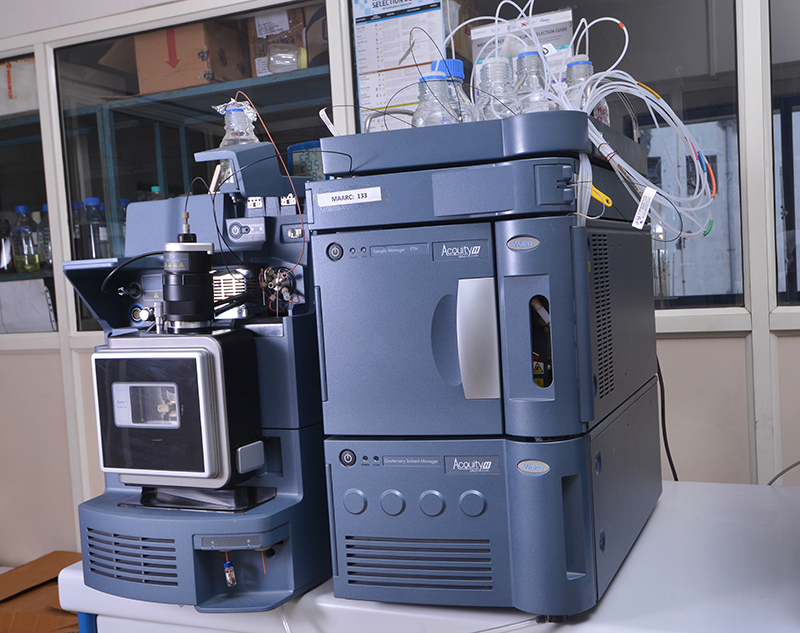 For non-polar pesticides, we combine mass spectrometry with gas chromatography. Partitioned through a non-polar solvent, these pesticides can be detected at ppb level from water, food products and fruit and vegetables. The GC/MS system comes with a NIST library with a ready database of spectra for comparison. 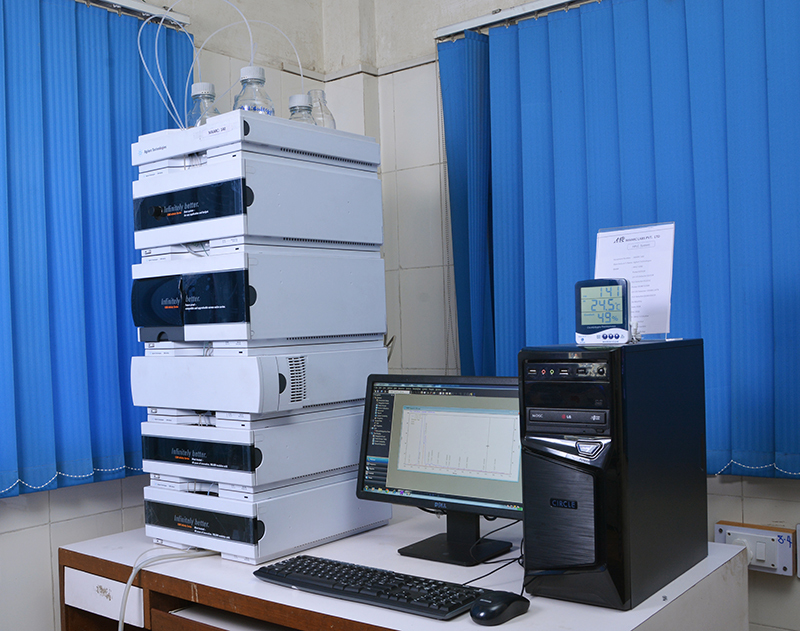 Also equipped with the MRM function, this instrument can accurately analyse hundreds of compounds from your products in a single run. The ion trap system is specifically dedicated to the analysis of pesticide residues in drinking water as per the BIS regulations. This system also comes with a Selective Ion Storage (SIS) facility to distinguish ions of interest from the millions of other background ions. We also have a NIST library on this instrument. 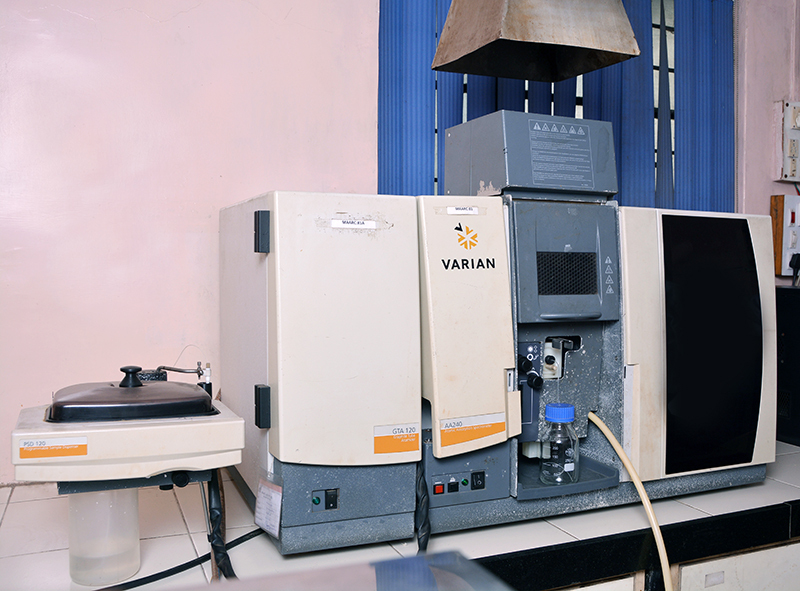 We also have a well-established Gas Chromatography (GC -FID/ECD) and Liquid Chromatography (LC -UV-VIS/FLD) set up, which are used for the analysis of contaminants such as Naturally Occurring Toxic Substances (NOTs), Aflatoxins in food & milk and methyl mercury in food as well as nutritional analysis of food such as fatty acids profile (MUFA, PUFA) & cholesterol. This set up also standardised for regular alcohol analysis required by distilleries. 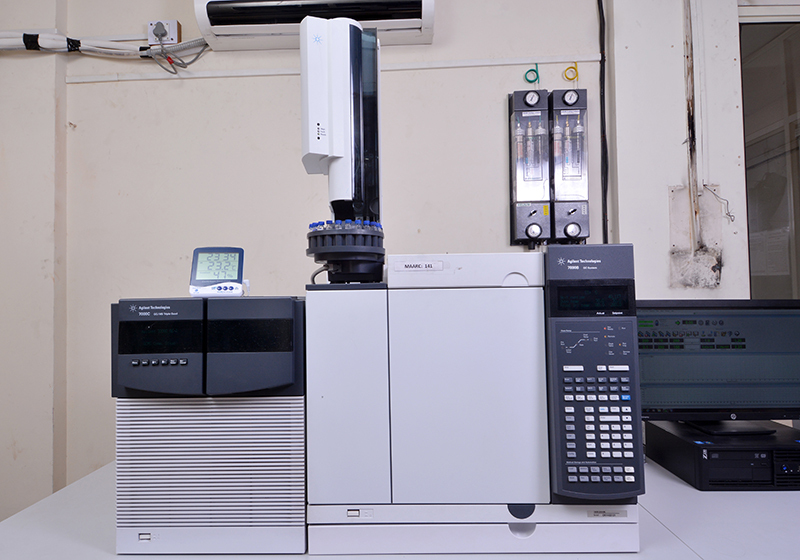 For, definitive analysis of various cations and anions in water, we have a dedicated ion chromatograph,Metrohm 883Basic IC , capable of detecting ions in quantities as low as 2 ppb. 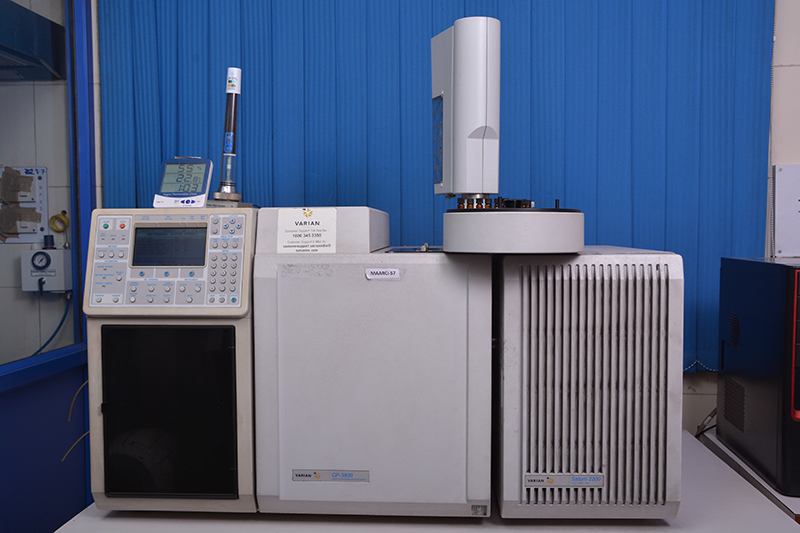 We also have an FTIR unit for the analysis of oil and grease in water. 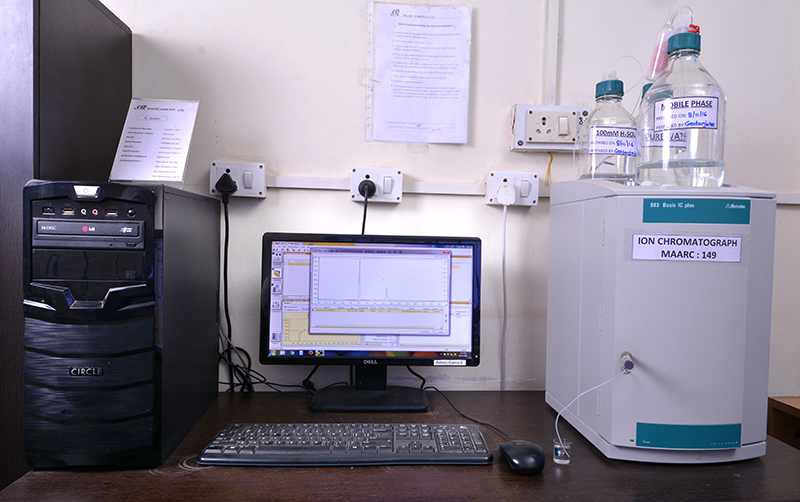 A number of spectrophotometers are set up for the quality analysis of sugar as per ICUMSA methods as well as the analysis of water. We know that when it comes to food and water, biological safety is equally important. Hence to offer you a one stop destination, we also have a state of the art microbiology lab with the latest equipment at your service. This gives us the opportunity to offer you comprehensive packages which cover both biosafety and chemical safety of your products. We also conduct shelf life studies. So you can now also involve us in your product development process. We would be more than happy to assist you! Click Here to see Our Infrastructure Of Lab on google.